When one of our computers fail I am always the lucky one who needs to investigate the problem. This time too… First thing I did was opening up the case. This is when I noticed that after turning on the computer the cpu fan would not even run. I immediately suspected the power supply. Unfortunately I was right, the power supply did not work anymore. When I replaced it with a spare I had lying around and turned the computer back on, I started to smell a very distinct odour. 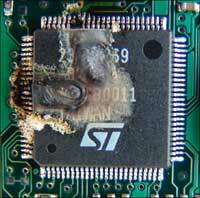 Burning electronics… Crap! I still remembered when I was young, my dad has a OSI (http://www.trailingedge.com…) After we get our Apples II, once he tried to clean it up and put it back into service…. when he power up the machine, I saw a thin line of smoke raise from one of the chips….. it fried and burned. That’s end of the life of this OSI. I bought the eMachine,and useing for about two months. What is the couse of this smell? I opened the cover of the pc. but I could not find anything bad. Next: Google to the rescue!